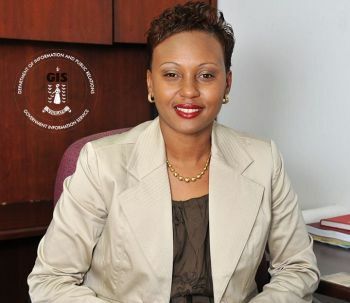 ROAD TOWN, Tortola, VI- Acting Chief Immigration Officer, Geraldine Ritter-Freeman had said in November 2017 that there were many challenges facing the Department of Immigration and had pleaded with the public to bear with it as it seeks to return to normal service in a timely manner. Nearly three months later it seems normal service has not returned and the public’s patience is wearing thin as visitors to the Department of Immigration continue to complain about the poor service, long lines and the frustration of losing sometimes a full day of work just to get an extension of time in the Territory while work permits are processed. But according to the expatriate worker, she feels bad for the Immigration Department's employees as they are just trying to do their job. Persons have also been expressing their dissatisfaction with the service at the Department of Immigration on social media, mainly the BVI Community Board on Facebook. Some have even resorted to tagging the various legislators with Facebook accounts as they express their frustration, hoping for some intervention. “Immigration needs help, there must be something that can be done to aid them. 8:30 A.M., all numbers given out for the day, well over 100 people stood on line for several hours, and were just told they won’t be seen today. 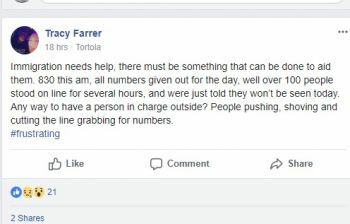 Any way to have a person in charge outside? People pushing, shoving and cutting the line grabbing for numbers,” a Tracy Farrer wrote. 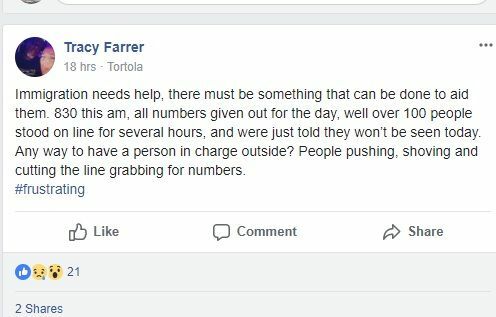 Her post prompted a series of responses, with many sharing their own experiences at the Department and criticising it for failing to urgently address the problems. Others called on Premier and Minister of Finance Dr The Honourable D. Orlando Smith (AL), who is responsible for the Department of Immigration, to intervene. Some persons suggested an appointment system for persons requesting extensions. Others were of the view the staff needs to increase. “I've said that all along, too, they need a second, maybe even a third office, and HIRE MORE STAFF TEMPORARILY! seems a no-brainer, high school kids after school processing/filing?,” a Leslie Cramer wrote. Our newsroom was told one person turned up at the Department before 4:00 A.M. this morning, February 14, 2018. 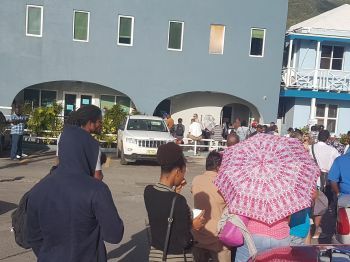 At around 7:50 A.M. our roving camera passed at the Department and noticed close to 70 persons outside of the Department of Immigration office, located in the RJT Edifice on Wickham's Cay I, Tortola. It was on November 22, 2017 that Ritter-Freeman had told this news site that the interim opening hours for the Department of Immigration are 9:00 A.M. to 1:00 P.M. to allow the Department to process as many persons as it can manually and then to take care of the back end processes in the afternoon. The opening hours for the Department; however, has since returned to 8:30 A.M. to 4:30 P.M.
“We know that the hours aren't ideal but we are doing the best that we can under the circumstances. To this end, I crave the public's indulgence as we seek to deliver professional services to the public,” Ritter-Freeman had said in November. Nearly three months after; however, the lines at the Department of Immigration are still long and close to 100 persons on a daily basis are unable to get service, even after showing up nearly three hours before the Department opens for business. This is not a port of entry fool. If you have no suggestion to the problem then stay quit. Empty vessel makes the most noise. So there's a fundamental gap between this dysfunctional Premier's Office and Law Enforcement, and Intelligence (in every sense), that can IN PRINCIPLE never be bridged or resolved. When are people going to figure it out? Dr. Smith Premier and his cronies are trying anything and everything they can to make BVI fail. They do not want help, just money!!! Slow/expensive internet, bad roads, bad sewer (money spent elsewhere), bad water, garbage mountain, BVI Airways $7 million give away, prhibitive tax/fees on charter tourists etc. etc. BTW, where is this big Disney Company that caused these guys to build the cruise Pier and failing Pier Park???? @concerned, Why would they try to make their Country fail if they live in it. when you all used to line up in the long line for western union to send off money how come that ain't reach the news??? I go to the bank, Western Union or any financial establishment, that's a choice and if I stay in line or go and come back another day, there is nothing to penalize me. On the other hand, however, to stay in the country (for whatever reason) you must go to the Immigration Dept to get your time updated. This is not only about hurricane volunteers. 1. A baby born in the BVI where parents are on work permit must get permission to stay in the BVI. 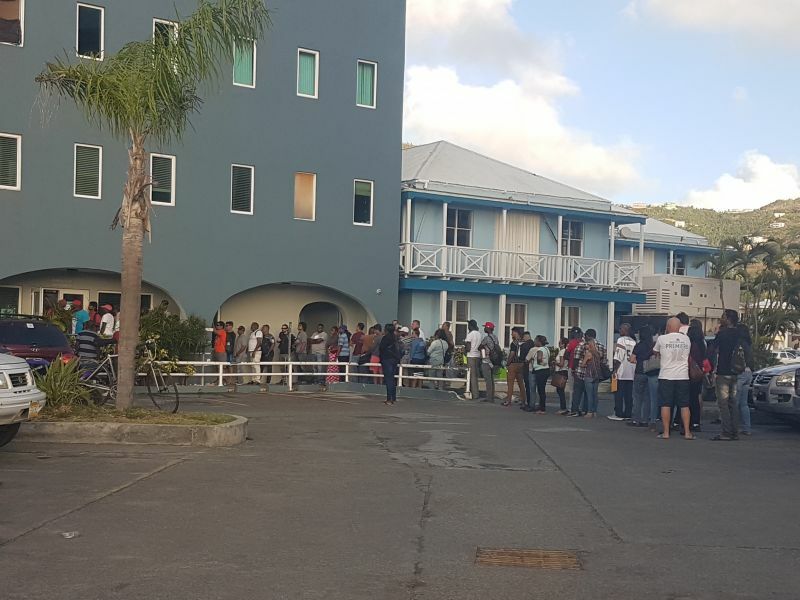 So, in this line, we have women who gave birth days or weeks ago waiting to get time for their BVI born child, which is not a citizen. 2. The same set of persons above, unless they have applied for Registration as an OTC, have to go to immigration every year to get their annual time. 3. Persons exempted from work permit still need to get immigration stamp. and the amount of persons visiting the Department have increased with less staff to perform the duties. People need to understand that it is not busines as usual. Has the government addressed your needs after the hurricane? If it has, the needs of the Immigration Department have not been addressed? Noticed I said needs not wants. The Government is breaking its own health and safety guidelines by allowing employees to working in a mouldy building that is making them sick, working under tents with no bathroom facility. This clearly shows that it is not busines as usual. These expats need to hush. We cannot go to their places and complain, we may end up in prison that same day. It almost happen to me in Jamaica because I complained how they emptied my luggage and I was there for about a half hour repacking because everything was shaken out on a table. If they cant wait, they should just go back where they from and the service is better. Enough is enough with these complaining expats. This is not a we versus expats issue , it's an issue of can we make the process run better. This anti expats sentiment is foolish and a waste of energy. As long as the BVI don't have surffficient human capital to deal with its growing economy we will be symbiotically tied to each other. So instead of having a negative relationship with each other we should promote and grow our mutual benefits. Please understand that the majority of these persons are NOT NEW ARRIVALS to "YOUR" territory. Many of us have been quiet, law abiding, every single BVI tax paying, civic volunteers, church going residents for years and sometimes decades. To have to wake at 4 AM in order to renew the same stamp I have been renewing for 13 years is a travesty of departmental inefficiency. The only thing I am complaining about (because I don't dare) is the time (and sleep) lost due to the process. UK nationals have to wait in line like anyone else. But BVI with UK passports can enter and stay in UK with no problems. So you're not correct to say it's the same for you. Britain need to stop all these types of citizenships in both Britain and their territories. There should be one citizenship; British Citizen. Like the United States and France. Fine, but then UK nationals should be able to come here as easily as BVI people can go to UK. You can't have it both ways. I know a Virgin Islander who is married to a Trinidadian and lives in Trinidad. This person is not allowed to get a job in Trinidad. And this is so throughout the caribbean. So what will the deductible be on work permit? Because if each time we go to collect our work permit and got extensions over and over , sometimes over a 3 month period. That is like a quarter of the work permit as passed. Shouldn’t those months be deducted from the 1 year work permit fee ???? Time is hard !!! No deductable, you pay full price you want the service we didn't send and call you. You ppl are very ungrateful, you have an opportunity to live here, the government don't have to keep you here, you want to stay right, well keep you mouth shut and wait your damn turn in line. without migrant workers, long term and short term, with a diverse range of skills, this economy dies. Before you get uppity, other big countries are also built on this concept. Those who realise the benefits while managing the needs (rather than people just moving with no job requirement to fulfill) thrive, the others will struggle. It is a very swift process to move manpower, knowledge, money and clients to other jurisdictions. BVI does not want to feel more of this (already started to lose out to other places). The immigration and labor departments have been experiencing customer service and efficiency issues for years. Something is wrong that they can't get it together. The people seeking service are treated as if they are begging a favor. They hold their documents and then can't find them. The stories are endless. I hear them all the time. They are talked down too and are belittled. As a BVIlander, I think it's time the government seriously take a look at what is really wrong. These people are no different to our great grand parents and our parents who had to leave Tortola to work somewhere else to make a living. Come on man, get the staff some training!!!! And how many of you is going to go back when the work permit expires and you have no employment. The Politicians are too political to manage... Everything is out of order out of control. They have no Clue listen to The Premiere Linking Haycraft with RTW. Srems like he doesnt know RTW was sold to a. Canadian Company that dont love people. @hush and vex.....both of you sound so stupid. The problem need to fix.like y"ll aint see what God is doing to this. All becauae of ignorance of tolans. Leave God out of this. He neither seen you, had talk with you or gave you any message to carry. Tolians are not ignorant. We were smart enough to find a way to survive when they said here was only good for birds to live; now all kinds of new species of birds are flying in each month. There must be plenty food here to share and spare. Can I make a suggestion: since there are issues with an influx of applicants, why can't management stagger the working and opening hours of the Department? Have some employees come to work for 7am and leave perhaps at 3pm and then have other workers come in for 12pm and leave at 6pm or 7pm? what about opening on weekends? we need to start to think outside of the box..
Immigration all over the world is problem, so why are you complaining about the VI UK. This is very short comparing to some countries. Imagine when we use to go to the US Embassy in Antigua then Barbados did you all complained when we had to stand in a line for hours waiting to hear your # called. How many times they turned down your visa application, how many of you spent hours in US Naturalization Office then come your time, you failed the test, after spending such a long time you left with nothing and your hard earned cash gone down the drain. VI UK Immigrations Officers need to take their time and screen people properly we cannot get timid and worry about the ranting and all the fussing via the media. People need to respect other countries laws and regulations, when it come to these VI UK everybody want a free for all. My advice to the Immigration Officers do your job with respect and smile from within. Every country have stiff Immigration laws and regulations, some of these Johnny come lately just came into the country and they already starting confusion. The trouble makers need to leave as soon as their task is completed, take a note of all of the folks who turn to the media thinking they can change things here and all they are doing is trying to hurt and insult these Virgin Islands. We don't need those type of people, we need people with IN God We Trust. Wait for your damn turn or walk with a book or magazine to read while you are waiting. I totally agree with you. And it look like she change the rules as she go along. Which country go to people home to determine how they are living before granting permits. I'm from here and it's an embarrassment to put people through this. We are all one Caribbean people and we need to look out for each other's interest and be more caring and sensitive. I think don't subscribe to the attitude that if you don't like it leave. But we are all entitled to our opinions. Remember .... . The former PS said she was uniquely qualified for that that job. Where is his A$$ today? Hmm. Time will tell.